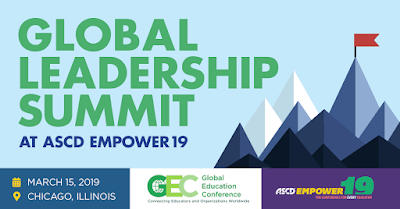 The fourth annual Global Leadership Summit, co-hosted by ASCD and GlobalEd Events, will convene classroom teachers, school and district administrators, and thought leaders in a full-day interactive, engaging program that empowers educators to lead classroom, school, districts, states, and policy arenas in supporting students as change agents in their own communities and around the world. Develop the capacity to lead classrooms and educational systems that foster in students the will and the skill to tackle problems of real-world significance locally and globally. Discover effective resources, best practices, and new ideas that can help students develop empathy, perspective recognition, critical thinking, problem-solving, communication and collaboration skills, and other competencies that students need to succeed in an interconnected world. Devise a plan of action to advocate and implement global learning initiatives. .
Network with innovative and inspiring teachers, principals, district leaders, thought leaders, and education organizations from around the country and the world committed to educating students for a diverse, global society. Save the date! Registration will open soon. To learn more, visit empower.ascd.org/globalsummit. A flyer for the event is available here.